After seeing such high ratings for this book and hearing everyone rave about how fantastic this series is, I caved and borrowed the book from the library. It seems that all the hype surrounding this book made my expectations too high. I don't consider myself an expert on angels and demons, but I've watched Supernatural and read enough books to get the gist. Every author seems to handle the whole angel, nephilim, demon, and fallen angel thing differently. 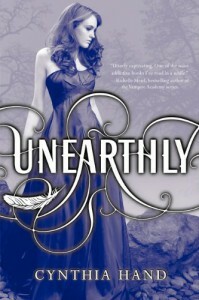 Unearthly is definitely one of the best angel books I've read in a long time, but not the best. I enjoyed the part about the purpose for the angel-bloods or nephilim and I really liked how the Black Wings radiated sadness due to their fall. The mythology and lore part of the book was amazing, but I think the book fell a bit flat with a few of the characters. I fully expected to love Clara. I'd heard that she was just plain awesome, but I must have been reading a different book from everyone else because most of the time I wasn't a fan of Clara. It was strange how she practically stalked Christian. Yes I understand that it was for her purpose, but her knowing so much about him without actually knowing him didn't sit right with me. Then there's the fact that she's immediately enemies with Christian's girlfriend. Kay wasn't exactly nice to Clara, but she wasn't really nasty either. Clara basically hated her because she was dating Christian. I also didn't like how Angela kept encouraging Clara to go after Christian and she kept saying that it was her destiny. I wasn't a big fan of Christian, mainly due to the incident a prom and how he's way too prefect. Clara's friends describe him as a god and perfect in every way. I can't stand perfect characters. I love characters that have flaws and develop as the the story progresses. Which is probably why I love Tucker. Tucker may have been a bit rude to Clara in the beginning, but I ended up liking him much more by the end. He's just a normal guy and he's extremely sweet. The story didn't get interesting until Tucker came along. This book wasn't amazing, but it also wasn't horrible. I will most likely end up reading the next book, mainly because I want to know what happens to Tucker and why Christian was Clara's purpose.